Together with Lukas von Hildebrandt, Johann Bernhard Fischer von Erlach is considered the most important architect of the late Baroque age in Austria. He was born near Graz in 1656 and died in the city that he enriched with several of his masterpieces, Vienna, in 1725. As a young man, he was trained as a sculptor by his father, the artist Johann Baptist Fischer in Graz. Only after this training he turned to architecture. For his studies, he travelled to Rome in 1670, where the works by Gian Lorenzo Bernini and Francesco Borromini left a deep impression on him. He stayed in Rome for several years and only in 1684, he moved to Naples, where he continued his work and studies. Two years later, he returned to Austria. There, he was welcomed as one of the ablest architects of his days - and one of the very few that were not Italian. One of his first projects was to design the interiors of tombs in Ehrenhausen in Styria. Two years later, he was in charge with a hall in Schloss Frain Castle in Moravia. From 1690, he was the teacher of construction and architecture to the Prince of Austria, the later Emperor Joseph I. 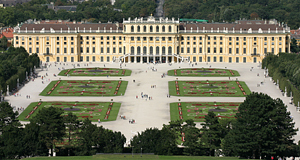 The years that followed brought one of the projects he will always be remembered for: The initial design of Schloss Schönbrunn Palace, which at some later point was supposed to overshadow Versailles near Paris (which it didn′t in the end, but it got close). In 1693, Johann Bernhard Fischer von Erlach transferred to Salzburg to serve to the Prince Archbishop. There he enriched the early Baroque city with some high Baroque buildings. This includes most notably the Church of the Holy Trinity with a college, as well as the seriously impressive Kollegienkirche (Collegiate or University Church). In 1694, when he had just about started the work on the churches in Salzburg, he became the "Imperial Courtarchitect and -engineer". Now his most productive and important years came, that saw the final design of the Salzburg churches described above as well as the formalisation of the Schönbrunn design, which was finally built until 1711. He was knighted in 1696, as the first artist in the history of the Holy Roman Empire. He kept high offices at court and in 1721, he published a textbook on the history of architecture - one of the first modern books of its kind. His most important buildings include the Imperial Stables that now house the MuseumsQuartier; the Collegiate Church and Trinity Church in Salzburg; the winter palais of Prince Eugene (today′s ministry of finance in Vienna); the Palais Battyani-Schönborn; the Böhmische Hofkanzlei on the Judenplatz Square; Schloss Niederweiden in Lower Austria; the Palais Schwarzenberg in Vienna; the Karlskirche Church and vast chunks of the Hofburg, including the National Library. The more recent additions of the Michaelertrakt were built in the late 19th century and only loosely based on Fischer von Erlach′s original designs. After his death in 1723, his son Joseph Emanuel Fischer von Erlach supervised many of the projects that his father had started. He also took over his father′s offices at court, although there was some significant resistance against that by rival Lukas von Hildebrandt. Despite of this early success, Joseph Emanuel eventually withdrew from architecture and pursued a career as a civil engineer in the mining business.